Research shows that sales of print and patterned socks are increasing while those of solid colors are declining. donning socks with colors and styles as unique as the individuals wearing them. Uniquely designed socks are a form of expression. They are accessories that complete an outfit every bit as much as jewelry, hats and eyewear. 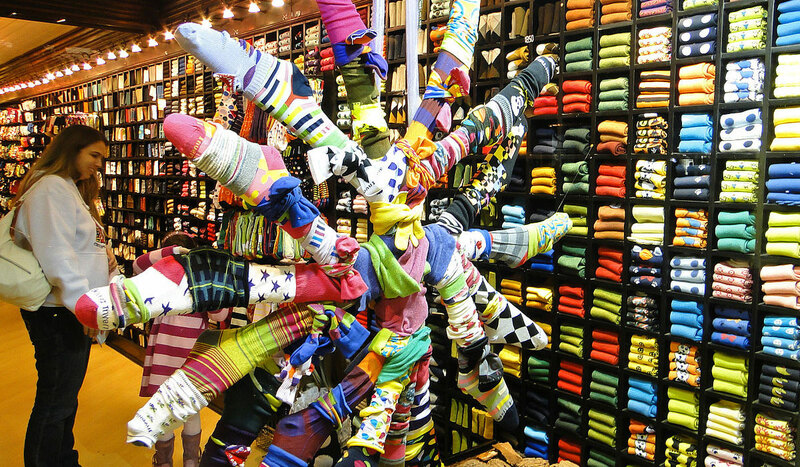 For sock suppliers and retailers, this means offering a multitude of colors and designs. Picking up on this trend are luxury apparel designers who have crated novelty socks with rhinestones and graphic prints. Famed designer Gucci added its well-known brand onto colorful socks, while Prada showed off knee-high soccer socks with heels at a recent fashion show. Socks with logos. People want to express their support for popular brands without it being too conspicuous. The perfect way to do that is by sporting logos on socks. This has become especially popular with luxury brands. Tropical motifs. Another emerging trend is the use of tropical designs and patterns. This includes bright citrusy colors combined with images such as palm trees, sunsets, coconuts, parrots, and flamingos. Floral prints. Men are getting into the trend of wearing floral designs on their custom dress socks. Bright solid colors. Some people are still reluctant to jump into the stylish sock trend with both feet, so they’re dipping a toe into the water by wearing a bright, solid color such as royal blue, sunny yellow, and bright red. These colors still grab attention with how they contrast normal work attire without being too audacious. Mix it up. People who have embraced custom socks don’t stick with one pattern. They may wear argyle one day, stripes the next, and maybe finish the week with a solid, yet vivid color, like pink or purple. They mix in unique patterns and unusual color combinations as well. Pop culture references. Whether it’s nostalgic references from decades past or what’s currently in vogue, people enjoy decorating their specialty socks with popular slogans, slang, characters and lines from movies and TV, and popular brands. The trend continues to favor bold sock designs at the moment. The days of blending socks with one’s attire are fading. Brands, therefore, will have to continue to push the envelope of design and offer a variety of bold sock designs to choose from. Sachin Patel has been designing socks for retailers, businesses, and promotional products distributors since 2010. His background in engineering and textiles is integral in streamlining production processes and developing detailed product specifications at EVERSOX, a worldwide supplier of custom socks.